They’re back…but not in the vineyard as of the middle of March. Although the calendar says spring, apparently Mother Nature hasn’t gotten the memo yet. 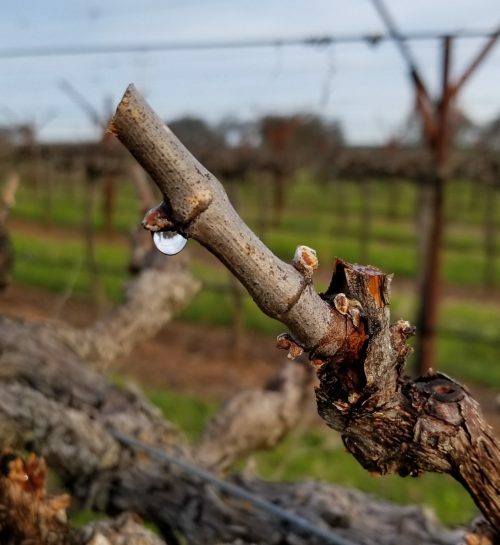 We are waiting on the vines to finally “come back” from dormancy and start with the bud swell already! If we can manage to string together a few nice warm days we might see some progress. The “they’re back” I am referring to is the long-anticipated return of our white and rosé wines. On March 23rd, we celebrated their return with our annual New Wines Release Party- always a good time. The stars of the party were our 2018 Muscat, 2018 Mamma Mia, 2018 Viognier, and 2018 Rosé. All will be available for purchase in time for summer- if it ever gets here! 2018 Viognier: A very floral and aromatic wine, with lots of mango, peach, and honeysuckle. Nice acidity, but not as acidic as a Sauvignon Blanc and not as fat as a Chardonnay. Great with Indian or Thai dishes. 2018 Mamma Mia: An off-dry white, with apricots, mandarins, acacia, and beeswax, with a touch of chamomile on the finish. Perfect wine to sit and watch the summer sun set with. 2018 Muscat: A sweet, dessert wine, it tantalizes both your nose and palate with Meyer lemon, orange zest, and citrus blossoms. 2018 Rosé: This wine brings the dark fruit of the bunch with blackberry, strawberry, and sour cherry blossoms. The rosé is also a sweet wine, and the winemaker recommends drinking it chilled with a ham sandwich on a hot day. All we need now is for the sun and warm weather to come back!